Wufoo makes it easy to setup forms to quickly accept RSVPs from multiple attendees. We have a special double feature for you fine folks here on Template Thursday! Not only have we added a new form template to our Form Gallery, but we have a video screencast tutorial on how it was made so you can use the same principles and techniques in your own event registration forms. 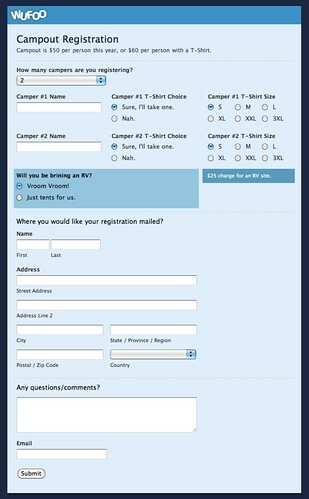 For this tutorial, we we’re going to recreate this Camping Trip Registration Form to show off how you can use Wufoo’s payment integration and form logic features to design a form that allows users to accept multiple attendees to register for an event online. The following video shows how to create the form in Wufoo, setup the rules for the fields to hide and show according to number attending, and how to apply the prices properly for the payment integration. If the user decides to register more than one camper, additional fields are displayed to collect information about them. They also have the option to individual order a t-shirt and select the shirt size. This uses Wufoo’s Logic and Branching feature, specifically Field Rules logic. Please note that if you’re installing this tempate from our gallery, that users on the Gratis or Ad Hoc plan can test out the payment feature with 5 free test transactions. Beyond that, a Bona Fide or higher plan is needed to use the payment integration beyond 5 entries.